Nathan Damigo, whose grandmother lives in Minot, founded Identity Evropa, one of the organizations behind Saturday's deadly rally in Charlottesville, Virginia. The grandmother of a white supremacist leader who helped organize the deadly rally in Charlottesville, Virginia, Saturday said her grandson’s racist views are a result of post-traumatic stress disorder brought on by two tours of duty in Iraq. Frances Lodge, 75, of Minot, said her grandson, Nathan Damigo – who was born in Lewiston in 1986 but moved to California as an infant – was radicalized while in prison in Oklahoma for a crime he committed while enlisted in the Marine Corps, and that his wartime experience changed him. Damigo was convicted of holding a cab driver he believed was Middle Eastern at gunpoint and robbing him. Damigo was sentenced to five years in prison, where his grandmother said he was introduced to white nationalist politics. In 2016, Damigo founded Identity Evropa, an Oakdale, California-based white supremacy group that focuses its efforts on college campuses, trying to recruit disaffected young white men. The organization bills itself as a social organization and fraternity intent on stamping out “cultural Marxism,” according to the Southern Poverty Law Center, which tracks hate groups and their leaders. Damigo promotes a vision of America in which white people will become a dwindling minority group and advocates for the separation of the races; he believes that nonwhites and Jews are inherently inferior to white Europeans. He also has referred to Lewiston, his birthplace, as a “Somali dump,” according to a profile of him by the SPLC. In an interview with radio station KQED in San Francisco, Damigo spoke about Lewiston accepting groups of resettled refugees, many from Somalia. Damigo and Identity Evropa were among the main organizers of Saturday’s white nationalist “Unite the Right” rally in Charlottesville, which descended into deadly chaos after counterprotesters clashed with white nationalists. Heather Heyer, a 32-year-old woman who joined the counterprotesters, was killed when a 20-year-old Ohio man rammed his car into a crowd of people, injuring 19 others. The driver, James Alex Fields, has been charged with second-degree murder. Damigo also was arrested in Charlottesville, on a charge of unlawful assembly. On Facebook and Twitter, he said he planned to sue the city of Charlottesville and was crowdfunding to raise money to pay for legal fees. By Tuesday afternoon, however, Root Bocks, the website that hosted the crowdfunding effort, was down. Damigo did not respond to requests Tuesday for comment on Twitter, through his organization’s website or his personal site. Damigo, who goes by “Fashy Haircut” on Twitter, appeared with white nationalist leader Richard Spencer at a news conference Monday in Spencer’s home to discuss the Charlottesville rally and the violence that followed. KQED reported that Damigo also was involved in an April protest in Berkeley, California, that turned violent. Damigo was seen on video punching a 19-year-old woman in the face. Most of the colleges Identity Evropa claims to have visited are in the South, West and Midwest, although photos from 2016 on the Identity Evropa Facebook page indicates members visited Bates College in Lewiston and put up posters for the group around the Bates campus. Bates spokeswoman Marjorie Hall said there is no record of an official event on campus featuring Identity Evropa, but said members may have come to campus, posted fliers or spoken to students. 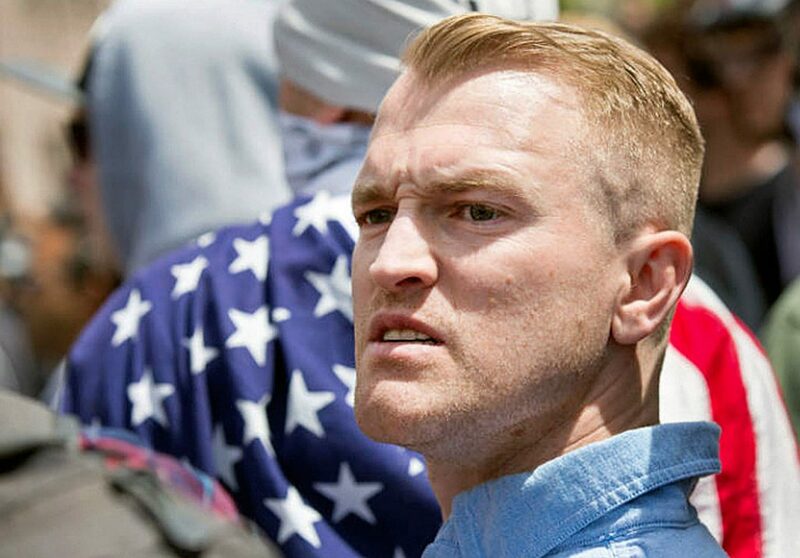 Damigo is among a new generation of hate group leaders who are fluent in using social media and digital communication to recruit followers and get their message out. They often do not overtly call for violence against groups they oppose, and they often resemble political organizations, with carefully crafted logos, merchandise, branding and media productions. Lodge, who said she last saw her grandson in July when he visited her and other family members in Maine, said she disagrees with his white supremacist views, but will continue to support his First Amendment rights to free speech and assembly. “There was a lot of racism in the prison, especially the one in Oklahoma,” Lodge said, explaining how her grandson came to his beliefs. The racist books he read, including that of former Ku Klux Klan leader David Duke, seemed to apply to the prison world, and crystallized into the social and political agenda he espoused after his release, she said. Lodge, who is a lay minister at a nondenominational Christian church in Minot, said Damigo’s biological father, Peter Lodge, is an adjunct professor of American history at the University of Maine at Augusta. He said he does not share his son’s views. The two do not speak often, she said. Peter Lodge, 53, of Bangor, said he relinquished custody of Damigo when he divorced his children’s mother, Charilyn Damigo. She remarried and her husband, Michael Damigo, legally adopted Nathan when he was 3 or 4 years old. Peter Lodge said he did not fight his son’s move to California or the adoption because he believed it was in the child’s best interest. Peter Lodge said he has rarely spoken with Damigo about his white supremacist beliefs. The last conversation they had was at a family reunion in 2014, when Peter Lodge said he tried to suggest to his son that he was headed in the wrong direction. Damigo was not interested in talking about it, Peter Lodge said. As a child, Damigo visited Maine about once a year for a week or two. He was raised in a religious household and attended religious schools in California until high school. When he graduated in 2004, Damigo joined the Marine Corps. During his two tours in Iraq, Damigo witnessed the ethnic tensions and violence there, he told a Los Angeles Times reporter in December. “I said, ‘This is dumb. Why don’t … each one of them have their own country and they can all express themselves and … they’re not, you know, fighting with each other,’” he told the newspaper. Today, Damigo’s group promotes a similar idea for the U.S., in which they believe in separating people by race and living in homogeneous areas. Frances Lodge said her friends and even some members of her family were not aware of Damigo’s political and racial views. When they are together with him, she said, she purposefully avoids addressing the subject. Damigo’s mother is an advocate for better treatment for soldiers suffering from PTSD through Blue Star Mothers of America, Lodge said. Charilyn Damigo declined a request for an interview made through Lodge. Damigo visited Frances Lodge and her husband most recently in July, after Damigo and his girlfriend did some sightseeing in the Boston area. Although Lodge disagrees with her grandson’s views on race and politics, she supports his right to free speech and to peaceably assemble and express himself. “The First Amendment gives us not only the right to free speech, but the freedom of assembly” as well as prohibits the establishment of religion by the government, she said. “In our family, both the Maine family and the California family, religion is a very big part of our lives. If you’re going to believe in that, you’ve got to believe in all of those rights. These rallies do start as peaceable assemblies. The anti-protesters make sure it’s not a peaceable assembly.” Lodge believes that if Damigo’s PTSD had been treated, his life could have been entirely different. “This is a great kid, and I’m sorry things worked out this way,” she said.